Product description: NATIONAL GEOGRAPHIC MAGAZINE 1 YR SUBSCRIPTION + FREE FLEECE JACKET WITH HOODIE is written by Amar chitra katha and published by Amar chitra katha. 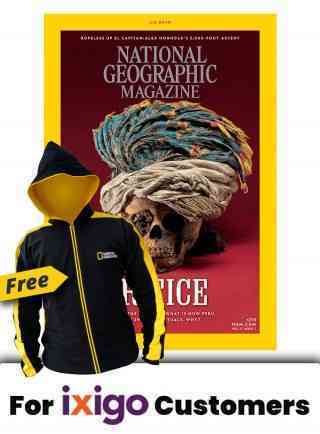 Buy NATIONAL GEOGRAPHIC MAGAZINE 1 YR SUBSCRIPTION + FREE FLEECE JACKET WITH HOODIE by Amar chitra katha from markmybook.com. An online bokstore for all kind of fiction, non fiction books and novels of English, Hindi & other Indian Languages. National Geographic Magazine 1 Yr Subscription + FREE Fleece Jacket with hoodie. The cover story in NGM India's Feb 2019 issue digs deep into the mysterious ritual killings of 269 boys and girls from the Chimú civilization, 500 years ago in what is now Peru. Another gripping read revolves around the big dreams--and serious concerns--about the demand for lithium mined from Bolivia, at a time when the metal is as precious gold thanks to its need in powerful batteries. The issue also holds notable features including one on famous climber Alex Honnold's terrifying, thrilling 3,000-foot climb up a rock face in U.S.'s Yosemite national park--without ropes.